1. pertaining to or containing cysts. 2. pertaining to the urinary bladder or to the gallbladder. cystic disease of breast fibrocystic disease of breast. cystic fibrosis a hereditary disorder associated with widespread dysfunction of the exocrine glands, with accumulation of excessively thick and tenacious mucus and abnormal secretion of sweat and saliva; it is inherited as a recessive trait; both parents must be carriers. The cause is thought to be absence, insufficiency, or abnormality of some essential hormone or enzyme. Called also cystic fibrosis of the pancreas and mucoviscidosis. Effects. The symptoms and severity vary widely. Although cystic fibrosis is congenital, it may not manifest itself significantly during the early weeks or months of life, or it may cause intestinal obstruction and perforation in the newborn. The chief cause of complications is the extremely thick mucus produced. Normal mucus bathes and protects internal surfaces, transports chemicals produced in one organ through intricate small ducts to another organ, and carries bacteria, dirt, and wastes to be eliminated from the body; thus it needs to flow easily. The mucus of cystic fibrosis, in contrast, is highly adhesive. Bacteria and other matter stick to it, and it in turn clogs the lungs and usually interferes with the flow of digestive enzymes from the pancreas to the small intestine. In the lungs, the mucus blocks the bronchioles, creating breathing difficulties. Infection develops, thereby increasing obstruction of the air passages. Air becomes trapped in the lungs (emphysema), and scattered small areas eventually collapse (patchy atelectasis). Repeated infections follow, inflaming and damaging lung tissue and leading to chronic lung disease. The organism that produces infection in cystic fibrosis is almost always a staphylococcus, but other organisms may be present in more severe cases. About half of children with cystic fibrosis have lung-related symptoms. When mucus prevents the pancreatic enzymes from reaching the duodenum (as in about 80 per cent of cystic fibrosis patients), digestion is hindered. Fats especially are poorly digested and absorbed. The child may have a voracious appetite, yet fail to grow normally or gain weight. There may be marked signs of malnutrition. The outstanding symptom associated with pancreatic enzyme deficiency is frequent bulky, fatty, and foul-smelling feces. Between 5 and 10 per cent of cystic fibrosis babies are born with intestines obstructed by puttylike intestinal secretions (meconium ileus) and die unless the condition is diagnosed promptly and relieved by surgery within the first few days of life. Such relief does not protect the child against the other manifestations of cystic fibrosis, although these may not appear until later. Because cysts and scar tissue on the pancreas were observed during autopsy when the disease was first being differentiated from other conditions, it was given the name cystic fibrosis of the pancreas. Although this term describes a secondary rather than primary characteristic, it has been retained. Diagnosis. Sweat in cystic fibrosis is excessively salty. Collapse of cystic fibrosis patients from salt loss during a heat wave led to recognition of the sweat abnormality. The sweat chloride test remains the cornerstone of diagnosis of cystic fibrosis. In children, a sweat chloride level above 60 mEq/l indicates cystic fibrosis. Newborn infants do not produce sufficient sweat for the test, but it has been noted that older babies “taste salty” when kissed. Supporting evidence can confirm the sweat test finding. Treatment. Under careful supervision by the health care team, parents are taught the principles of home treatment of cystic fibrosis. The child may be required to sleep regularly in a plastic mist tent, into which a dense fog is pumped to help liquefy mucus and check infection. Aerosol therapy is generally prescribed. Extracts of animal pancreas taken with meals, which should be high in protein and low in fat, compensate for pancreatic deficiency. Physical therapy involving postural drainage together with “clapping” and “vibrating” aids in loosening the mucus so that it can be coughed up and expectorated. It is estimated that in the United States cystic fibrosis occurs once in every few thousand births. Caucasians appear more subject to it than blacks, and among those of Asian descent it seems to be rare. Patient Care. Maintenance of the child's nutritional status may be difficult because of his tendency to cough and vomit frequently during feedings, and also because of difficulty in breathing. Small amounts of food, given slowly and at frequent intervals, are best for infants as well as for small children with cystic fibrosis. Skin care is important, especially for infants and toddlers who are not yet toilet trained. The stools are likely to be copious and extremely irritating to the skin. Frequent turning of the infant or bedridden child helps to prevent decubitus ulcers and lessens the danger of pneumonia, a constant threat to these children. Prevention of infection is a most important aspect of the care of these children because of their extreme vulnerability to disorders of the respiratory tract. Education of the parents must include the dietary regimen; how to use the Croupette, a machine for aerosol therapy in the home; hygienic measures to prevent infections; and the importance of continuous medical follow-up and administration of medications prescribed for the child. Cystic fibrosis. 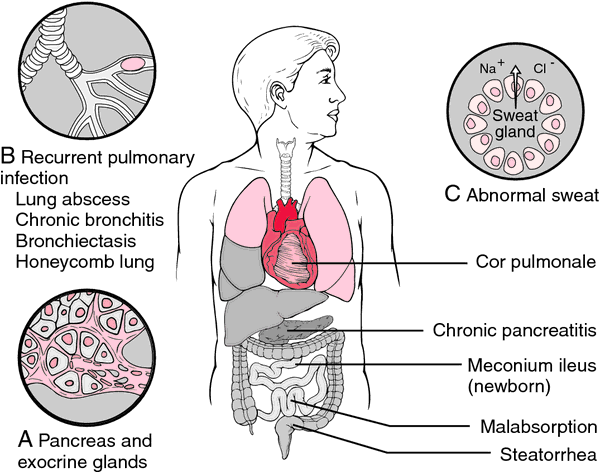 The abnormal chloride transport associated with cystic fibrosis in a lack of sodium chloride in the secretions of all exocrine glands, especially the pancreas, intestine, and bronchi. Redrawn from Damjanov, 2000.
cystic kidney disease (cystic disease of kidney) see acquired cystic kidney disease and polycystic kidney disease. See acquired cystic kidney disease and polycystic kidney disease.